No, that's not the slogan we'll be suggesting for our newest account, Turner's Outdoorsman, a chain of 13 hunting and fishing outlets throughout Southern California. We're excited about working on this account as it's more advertising intensive than PR-intensive as are most of our clients. More exciting is that we'll be back together working with Don Small, the marketing guru behind the success of HID, the card company, who we helped launch and bring to number one some years back. For those that know "Big Don," the ownership of such a company comes as no shock. Don and his wife have more animal heads in their house than most zoos have in their cages. When Leslie's and my son was quite young and visiting the Small trophy bastion, he went up to the Big Fellow and remarked, "Don, I'm better than you." When Don asked why, Rocky replied, "All my animals are alive!" We'll be entertaining editors at Realization Technologies' Project Flow Conference in Chicago September 8-9 and then keep right on moving to ASIS in Orlando for the big security conference September 12-14. If you're not scheduling editors at your own conference or industry trade shows, you're missing out. It's like a press tour without all the plane trips and lack of sleep. 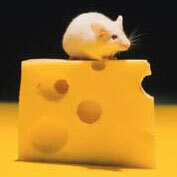 Which is more important - the mousetrap or the cheese? The ideal combination is a technically advanced product with superior marketing execution. If you cannot always have the former, you can always have the latter. That's good, because the best cheese always attracts more mice than the best mousetrap. If you need some cheese, give us a call.